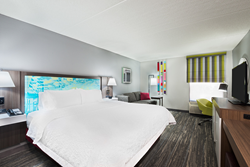 Hampton Inn by Hilton Ellenton-Bradenton announces the completion of renovations to its property. Upgrades were made to the guest rooms, lobby, business center, fitness center, and outdoor pool area. The hotel now features elements of the new Forever Young Initiative (FYI) designed to provide guests with accommodations that are multi-functional, modern, convenient and comfortable. FYI helps to extend the life of high-performing properties by upgrading indoor and outdoor design elements, applies innovative thinking to new prototypes and compliments current initiatives like the Perfect Mix Lobby. The scope of the multi-million dollar renovation includes new carpet, bedding, floor tile, curtains, paint, wall vinyl, artwork and new soft seating furniture. “The multi-functional, modern, and convenient refresh is another way of telling our guests ‘We love having you stay with us,’ and is another milestone in our perennial efforts to ensure 100% guest satisfaction,” said Brandy McDonald, general manager. "We are confident our latest renovations exemplify the highest Hampton standards and what our guests expect from our brand." The 115-room property, located at 5810 20th Court East, Ellenton, is minutes from Ellenton Premium Outlet with over 130 stores to choose from. In addition to the renovated areas, Hampton Inn by Hilton Ellenton-Bradenton offers amenities including a 24-hour business center with complimentary printing, free Wi-Fi and free hot breakfast. Guestrooms are equipped with the brand's signature Clean and fresh Hampton bed®, mini fridge, microwave and coffee maker. Whether you're in Ellenton for a sporting event, a business trip or just to relax you're assured the offers of warm surroundings, a friendly service culture and a staff that makes sure guests are 100 percent happy. Guaranteed™. To make reservations or for more information please visit http://www.hamptoninnbradenton.com or call the hotel directly at (941) 721-4000. Buffalo Lodging AssociatesBuffalo Lodging Associates is a fully integrated hotel development and management organization that owns and operates hotels throughout the Eastern United States and Ontario, Canada.